While you can go online and find any regular drywall company in Illinois that can help you with your building’s drywall installation needs, it’s important to remember that this stage is just one step in a multi-phase process. As a property manager or building owner, you are likely dealing with enough tasks without having to stress about coordinating your contractors to ensure a cost-effective outcome. One way to reduce the stress centered around your building improvement or expansion is to leave the work to AZ Drywall Finishing. Since 1999, our professional drywall contractors in Chicago have worked hard to refine our skills and create the most durable and cost-effective outcomes for each of our customers across the state. Our drywall finishers provide turnkey services to ensure that you are receiving the best possible service for your investment. You can minimize miscommunications and costly errors by working with our all-in-one commercial drywall company. Read on below to learn more about our drywall and finishing services. Metal stud framing has quickly become a favorable choice in the construction industry because it is lightweight, versatile, fire-resistant, and now more affordable. Our steel framing contractors will get the job done right the first time, utilizing steel that will not shrink, twist, or rot, saving you on project costs overall. 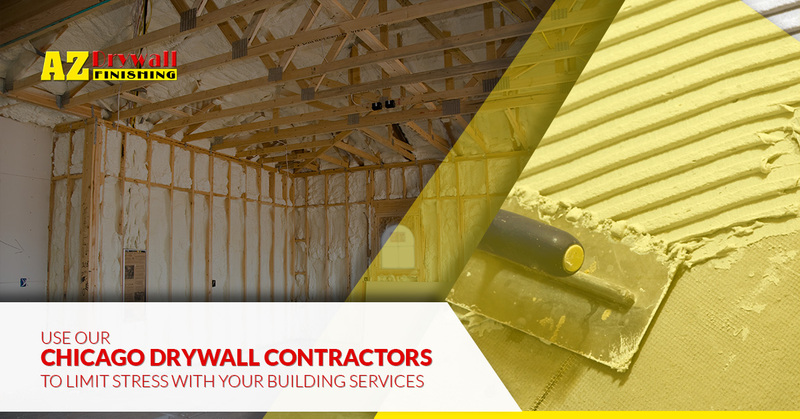 From small expansions to franchise buildings, our drywall company is ready to implement the backbone and provide expert support for your project. As the name entails, our team is here to deliver comprehensive quality with top-notch taping, mudding, sanding, and finishing services to ensure that you are pleased with the precision of your commercial drywall project. Over the years, AZ Drywall Finishing has honed the installation process, creating quality outcomes that feature flat, flawless surfaces that are primed and ready for the next step in your construction project. Regardless of the size or design, our team will work hard to create a precise outcome that matches your standards and your budget. Your project may all be for naught if the final phase of wall construction is not done correctly, and our drywall finishers are here to ensure that you receive the exact outcome for your company’s specifications. Our team specializes in cement-based finishes and painting services, delivering the right texture and matched color for the a finish that is sure to impress your guests and employees. This part of the project can be especially crucial for franchises that wish to retain the same level of quality wherever their brand is established. Our drywall contractors have years of experience working with a variety of businesses across multiple industries, and our skilled team is ready to pass the benefits onto your company. Some businesses can benefit greatly from sound-blocking ceiling tiles being installed correctly in areas of need. This can be very helpful for hospitals, apartments, office buildings, and more. Our drywall company has the experience to create beneficial outcomes in a variety of structures to match differing goals, such as spot acoustics or ceiling clouds. In either case, you receive services that are done right the first time. If you are looking for a commercial drywall company that can meet all of your business’ unique needs and budget, it’s important to find a team that has the experience and a proven track record for success. AZ Drywall Finishing is here to serve as your comprehensive drywall contractors in Chicago, delivering cost-effective solutions that are all integrated into one seamless plan. We strive to deliver the best services to all of our commercial and industrial drywall clients. If you are looking for a company that can work with you to create professional outcomes for your business, be sure to contact us today for a quote!